Not everyone will be a winner under the Trump tax cuts (the Tax Cuts and Jobs Act, or TCJA). According to the 2018 Internal Revenue Service (IRS) withholding tables, workers will have more take-home pay, but for many, the reduced withholding will not be enough to cover the actual tax owed. These employees will have to pay more when they file, and, in some cases, the situation could result in a penalty for under-withholding. In response, the IRS last week announced it will waive underpayment penalties if withholding totals at least 85 percent of the tax owed for 2018. Learn more in this Forbes article. Consumer Action’s founder, Kay Pachtner (née Kathryn Jane Bahmer), died on Dec. 6, 2018, at her Northern California home. In 1971, Pachtner—then a student activist and homemaker—organized a group of volunteers to respond to consumer complaints that came in to a “hotline” in their makeshift church basement office. Calling itself San Francisco Consumer Action, the group soon added a mobile complaint unit in an old van and began staging public protests, the most visible of which involved a picket line the group set up in front of San Francisco’s posh British Motors to protest the sale of a used Jaguar that kept breaking down. Consumer Action picketed on behalf of the owner, who had been assured by British Motors that the lemon was in “mint condition.” The group prevailed in a $6 million defamation lawsuit brought by the car dealer, establishing the right of aggrieved consumers to picket businesses in response to unfair and deceptive sales. Pachtner’s legacy continued to grow as Consumer Action expanded from its small group of volunteers to a trusted national organization run by seasoned consumer affairs professionals. Pachtner left the group in the late ‘70s, but remained as emeritus member of the board of directors. A 1975 New York Times article by Henry Weinstein, entitled “Inside a Consumer Group,” chronicled the organization’s early efforts under Pachtner. 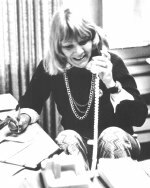 Consumer Action founder Kay Pachtner handles a hotline call in the early 1970s. Many have marked Pachtner’s passing with memories of her groundbreaking activism. Consumer Action’s executive director, Ken McEldowney, met Pachtner when he was a reporter and editor at the San Francisco Bay Guardian. “Kay, early on, noticed that there was more to consumer complaints than just individual problems. She brilliantly was able to parlay consumer complaints into representative actions such as boycotts and protests, which were essential to propelling the nascent consumer movement into the spotlight,” McEldowney said. In “Inside a Consumer Group,” Pachtner and her colleagues’ early successes are explored in-depth, including their issuing of the first comprehensive local survey of bank services and prices: “Break the Banks: A Shopper’s Guide to Banking Services.” The survey, along with Consumer Action’s push for reform through legislation, regulation and lawsuits, brought the group nationwide recognition. “Pachtner leaves a stellar legacy of accomplishment and public service,” Consumer Action Board President Patricia Sturdevant said. Consumer Action’s Joe Ridout attended the Consumer Federation of America (CFA) Financial Services Conference in late November in Washington, DC. The Financial Services Conference covers how the newest consumer financial products, services and emerging technology impact consumers, and the latest in new and proposed regulations governing the consumer financial services marketplace. Ridout reported back on notable sessions at the conference, including one entitled “Is cashless retailing good for consumers?,” in which panelists considered the growing movement toward electronic payments. Cash payments have rapidly fallen. In 2011, 19 percent of consumers reported using cash for all purchases; as of 2016, that population was a mere 10 percent. Not surprisingly, cash versus credit/debit preferences change with the amount of the transaction: 60 percent of consumers prefer cash for purchases less than $10. Panelists discussed peer-to-peer payments and cashless platforms, like Apple Pay, Venmo, Cash App, Intuit, PayPal, etc., and how payments by smartphone are moving toward immediate or “real-time” transactions. The conference's student loan panel featured former Consumer Financial Protection Bureau (CFPB) student loan ombudsman Seth Frotman, who left the federal agency after criticizing the Trump administration for its efforts to undermine the agency’s work to protect student borrowers. (See this month’s CFPB Watch, below.) Frotman went on to create the Student Borrower Protection Center to foster meaningful improvements for besieged borrowers who have been the victims of sham schools, predatory lending practices and little-to-no protection from the Department of Education under Trump-appointed secretary Betsy DeVos. During the panel, Frotman expressed his outrage that “Betsy DeVos alone controls the financial future of 44 million Americans.” Frotman pointed out that there are currently eight million student borrowers in default and another five million heading in that direction. He stressed the importance of not only broadening the federal government’s framework for oversight and enforcement, but also of strong state oversight. Frotman called state banking agencies “mini CFPBs in waiting,” and said that voters must pressure those running for state government to commit to creating a more accountable system for student loan borrowers. Another timely panel, on the criminalization of debt, examined how government fines and fees are turning otherwise law-abiding low-income Americans into criminals. The fines/fees problem was illustrated with examples in states like North Carolina and Maryland. In North Carolina, drivers caught not wearing seatbelts are charged $25 fines and additional mandatory $178 fees. In addition, drivers’ licenses are automatically revoked if the accused do not (or cannot) pay the fine. In Maryland, 1.8 million automatic tollbooth violations occurred in 2016, amounting to $6 million in tolls owed, with a whopping $92 million in additional penalties! Outstanding fees and fines often lead to arrests and criminal records. According to the non-profit Woodstock Institute, low-income and non-white ZIP codes are 40 percent more likely to be issued tickets in the first place, worsening the disparity in enforcement. Unfortunately, greater transparency with regard to fine/fee waivers has discouraged judges from exercising reasonable discretion, since political opponents use this information to compile “report cards” on more lenient judges and attack them as lax on crime, Ridout reported. Another session that delved into the issues disproportionately impacting low-income consumers focused on payday loans. These pervasive loans, which often carry 300+% interest rates, loom large in the criminalization of debt. In states like Utah, after payday lenders “win” a default judgment against borrowers who are unable to repay, the court issues a bench warrant unless the debtor pays additional fees on top of the loan. Like fines and fees, this practice traps consumers in vicious debt cycles. For more info on the CFA Financial Services Conference, click here. A Florida woman contacted Consumer Action’s hotline with a complaint against a large dental chain, Aspen Dental. Ariel* told us that her visits to Aspen got off on the wrong foot and went downhill from there. To make matters worse, Ariel was given poorly fitting temporary dentures that cracked almost immediately and had to be remade. As if this weren’t bad enough, when she returned for her permanent dentures almost six months later, just before the busy holiday season, she was told they were not ready. “Aspen Dental’s office is very unorganized and inconsiderate to the patient’s needs,” said Ariel. Our counselors advised Ariel to submit a complaint to the Florida Department of Health, which regulates dentistry services in the state, and to the American Dental Association. A 2012 FRONTLINE exposé paints a grim picture of Aspen Dental as a profit-driven company that offers patients “no-interest” credit cards with steep fees and penalties. Even former employees featured in the exposé had little good to say about the company. “People would come into the office maybe with a toothache and come out with a treatment plan [where] maybe the dentist said, ‘We need to extract all your teeth,’” a former office manager in Illinois told the PBS documentary series. Not surprisingly, consumers have logged thousands of complaints about Aspen Dental on internet complaint sites. In light of these findings, we advise consumers to compare the services of several dentists and to consider focusing on local dentists in private practice, as opposed to those franchised or employed by dental chains. With most private dental practices, patients can see the same dentist every time they visit the office and possibly establish a rapport with the provider. With a corporate chain, they might see a different dentist on every visit, and the dentist they saw last time may not even be with the chain any longer (since some chain-affiliated offices tend to have higher turnover rates). When looking for dentists, it also may be wise to avoid commercial referral services such as 1-800-DENTIST. Not every dentist participates, and dentists referred by these services are not necessarily any better or worse than dentists that don’t participate. Instead, try the ADA’s Find-a-Dentist tool. WebMD offers advice about vetting medical and dental rating sites. For more tips on “How to Find a Good Dentist,” check out this US News & World Report article. More could be done to stop harassment from debt collectors. Nearly 75 advocacy groups joined together in urging new Consumer Financial Protection Bureau (CFPB) director Kathy Kraninger to implement stronger rules to protect the 71 million U.S. adults with debt from abusive and harassing debt collection practices. The CFPB received approximately 84,500 complaints about debt collectors in 2017 alone. Learn more. The 116th Congress must put students at the top of their agenda! Consumer Action joined 49 advocacy groups in urging the new Congress to work toward a Higher Education Act (HEA) reauthorization bill. The HEA bill should broaden opportunities for students, including low-income students and students of color, and increase accountability in order to protect students, families and taxpayers from low-quality and unscrupulous colleges. Learn more. The time is now for consumer data privacy legislation. Consumer and privacy organizations released a framework to guide the new Congress in creating comprehensive consumer privacy protections and defining digital rights. The groups emphasize that Congress must overhaul U.S. data privacy laws (without pre-empting state laws) and that Congress must create a new data privacy agency to confront 21st century threats and appropriately regulate emerging technology. Learn more. The government shutdown is putting working families at risk. As the lengthiest federal government shutdown in our nation’s history drags on, advocates are voicing concerns about the long-term impact on working families, even after the government reopens its doors. Without a paycheck, federal employees who cannot pay their rent or mortgage risk losing their homes and damaging their credit due to missed payments (whether mortgage, utility or cell phone). These employees may take on risky loans to make ends meet while awaiting a delayed Earned Income Tax Credit or tax refund. Learn more. The first official order of business for Kathy Kraninger, the new director of the Consumer Financial Protection Bureau (CFPB), was to end formal efforts to change the name of the Bureau. Former Acting Director Mick Mulvaney had begun plans to call the CFPB the BCFP (Bureau of Consumer Financial Protection), a change that would cost the private sector a reported $300 million and the federal government another $19 million. Given that the name change had zero supporters, Kraninger wisely chose to drop the rebranding effort and find a reasonable compromise to honor Mulvaney’s demands. For statutory reports and legal filings, Kraninger has announced that the Bureau will use the BCFP name; for all other Bureau business, the CFPB will keep its consumer-oriented name. (Both names are found in the Dodd-Frank Act that created the Consumer Bureau.) Hopefully, finding solutions that all parties are satisfied with becomes a trend under the new leadership. The Bureau’s former temporary director, Mulvaney, had refused to release a crucial report on college campus bank fees prepared under his predecessor. Groups including the National Consumer Law Center and Allied Progress used the Freedom of Information Act to compel the release of the information, which revealed that average bank account fees paid by students in the 2016-17 academic year reached as high as $46.99. The report on college-sponsored bank accounts found that of the 573 college-sponsored accounts examined, Wells Fargo charged the highest average fees (at $46.99). This is nearly double the fees charged to students by TCF Bank and U.S. Bank, which ranked second and third in the report. According to the report, students paid three times more in account fees on average at colleges that accepted payments from banks in return for promoting their accounts to students. The Bureau’s former student loan ombudsman, Seth Frotman, resigned last August due, in part, to Mulvaney’s decision not to publish the campus banking report. Frotman said the report had evidence that some of the country’s biggest banks were “saddling [students] with legally dubious account fees." In his resignation letter, Frotman accused Mulvaney of abandoning student borrowers and instead using the Bureau “to serve the wishes of the most powerful financial companies in America." The student loan ombudsman position is a legally mandated role (under Dodd-Frank) and remains vacant since Frotman’s departure. For more about this issue, see Consumer Action’s college-sponsored accounts alert. The CFPB settled claims against Sterling Jewelers for opening store credit card accounts and enrolling customers in payment protection insurance, all without consumer consent. The Bureau also accused Sterling of misleading customers as to why they were collecting their personal information. Sterling Jewelers operates 1,500 stores across the country under the names Kay Jewelers, Jared the Galleria of Jewelry and others. Sterling was fined $10 million by the CFPB and will pay another $1 million to the state of New York for violating the Truth in Lending Act. Consumers, however, will receive no refunds for the unwanted payment protection insurance and no recompense for the negative impact to their credit records and unwarranted access to their personal information. Class action settlements involving toilet paper and Charmin wipe maker Procter & Gamble’s advertising claims and Compass Bank’s automated calls were among nine new settlements added to the Consumer Action Class Action Database during January. Of note this month is the class action settlement Liptai v. Spectrum Brands Holdings, Inc. et al. The plaintiffs filed a class action suit against Spectrum Brands Holdings, Inc. and Applica Consumer Products (now known as Spectrum Brands, Inc., collectively “Spectrum Brands”), alleging that the defendants misrepresented their kitchen appliance products as genuine Black & Decker and Farberware products. Spectrum Brands acquired a license to use the Black & Decker and Farberware names on certain small kitchen appliance products manufactured and designed by Spectrum Brands. Plaintiffs alleged that the defendant’s advertising led consumers to believe they were purchasing genuine Black & Decker and Farberware products. One plaintiff believed, based on the product description, that he had purchased a genuine Black & Decker 12-cup coffee maker made by Black & Decker (even though it was manufactured and designed by Spectrum Brands). Plaintiffs also claim that Spectrum Brands falsely advertised that Black & Decker and Farberware would provide warranties for the Spectrum Brands products. Spectrum Brands also is accused of misrepresenting the cup capacity of its coffee makers. The FDA defines the amount of a full cup of coffee as eight fluid ounces, but Spectrum Brands coffeemaker “cups” hold only five-and-a-half fluid ounces, even though its advertising would lead the average consumer to believe that its 12-cup coffeemaker produced 12 cups of eight fluid ounces. Spectrum Brands denied all the allegations but agreed to a settlement in order to get out from under the lawsuit. Consumers who bought certain Black & Decker-branded kitchen appliance products and certain Farberware branded products may be eligible for a partial refund of up to $4. The claims deadline is Feb. 28, 2019.